Tell us a little about you? Emma, it seems that when you’re not eating or sleeping, you’re doing things that go the distance! You’re a long distance runner, long distance hiker and recently just flew the distance to start teaching in Hawaii! What first got you into distance hiking and running? I started running longer distances when I was in college, mostly out of convenience. One semester while studying at Middlebury College in rural Vermont, I didn’t have a car on campus but still wanted to find ways to get outside. There was a small mountain roughly 10 miles from my dorm that was a pretty great spot to catch the sunrise or sunset, but without a car (or a bike) I was left to my own two feet to get me there. So I just started running there! By my senior year, I was running the 20 miles roundtrip fairly regularly. After running 20 miles to catch the sunrise from a mountain top and make it back before my first class of the day became not so unusual, longer distances didn’t feel so daunting. I think long distance hiking and long distance running come kind of hand in hand, as they both require very similar mental and physical demands. I’ve found that both walking and running long distances often serve as processing time for me, as my body finds a rhythm in the motion and allows my mind to either work through things or to simply remain still for a while. The summer I turned 21, I hiked the Pacific Crest Trail as my first long distance hiking endeavor. I ended up churning out the trail pretty quickly, largely due to the time constraints of squeezing a thru-hike in one summer break of college. After that, it was fun to see how far my feet could take me without a backpack on and I started trail running a lot more. Right after I turned 22, I ran my first ultra-marathon when a good friend asked me to run a 50K with him. It was a ton of fun and I totally got hooked on big miles. What are some of the thoughts you have in the first 1 hour, 5th hour, 10th hour or last hour starting out on a run? How do you mentally prepare for such an endeavour? Before setting out on a long run, I usually just try to make sure I have all my bases covered: do I have a turnaround time, an alternate route, or a bailout option in mind in case my body isn’t feeling it and I need to adjust course? Do I have enough water, food, and light to make it where I want to go, even if I’m running really slow, or walk it out? Having all of these questions answered ahead of time make it easier to let my mind float and focus on other things rather than continually working through the logistics of the run. What are some of your favourite training runs at the moment in Hawaii? The fun thing about living in Hawaii is that Big Island is full of crazy terrain. Living on the side of a volcano certainly limits the availability of flat ground and provides a good training for running all sorts of hills. Most days I get out to do a quick 7mile loop around my neighborhood - which involves running down to the ocean, along the coast through the town of Kona, then back up to my house, with a ~1,000ft elevation gain along the way. On weekends, I tend to do laps up an ancient cinder cone (Pu’u Wa’awa’a) on an 8mile trail with nearly 2,000ft elevation gain. I love that spot because it’s totally different from the coastline or the lava fields: it’s filled with cows, goats, and sheep roaming around lumpy green pasture, and there’s a great view from the top! My current favorite long runs are a bit more remote. A good 14-20 mile trail run can be found on the Northeast coast of Big Island running from Waipio valley up the Muliwai trail over into Waimanu valley and back again. A better spot for even longer runs are on Mana road, a 50-mile rough and remote dirt road that circumnavigates Mauna Kea, the tallest volcano on the island. Running around on top of Mauna Kea is also a good spot to get some training in at altitude! Do you listen to music as you run? What are you jammin’ to at the moment? I tend to not listen to music as much while running on trail as I do when I’m pounding pavement. When I’m on longer runs, I often save music for the darker hours. Beyonce and Taylor Swift are consistently my top played, but I generally just keep my iPod on shuffle. 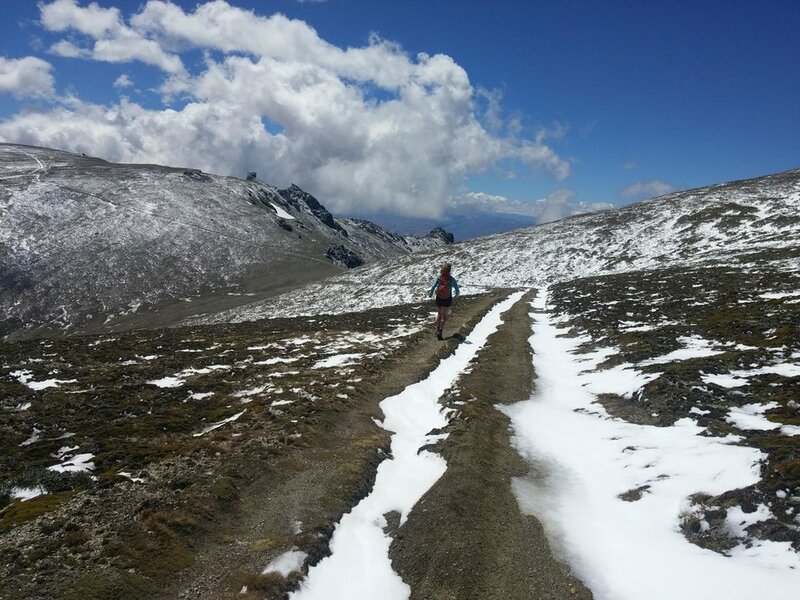 Last year you travelled to New Zealand and completed the Te Araroa solo! Tell us about that, what inspired this trip for you? Have you done any other adventures of the sorts? When I was 20, I solo-thru hiked the Pacific Crest Trail and loved it. That trip added a bunch of ideas to my bucket list, one of them being a thru-hike across New Zealand. NZ is such an amazing part of the world and I have found travelling across a country by foot to be the most genuine way to both see and experience a place. It's amazing to watch landscapes change below your feet. Traveling alone lends itself well to a sort of simplicity that is hard to access elsewhere. Moving big miles on my own has definitely helped me to work through trying experiences, while bolstering my sense of confidence and independence. Its allowed me space and time to learn a lot about myself and the world around me. The PCT and the Te Araroa are the only thru-hikes I’ve done so far. While I don’t have anything planned for “what’s next” yet, I could see myself opting for another long thru-hike (potentially the Continental Divide Trail) whenever another big enough window of time presents itself. In January 2018, I’ll be trying to tackle my first 100 mile run in Hawaii’s HURT ultramarathon. I’m not too sure what will be next after that, but I’m excited to find out what the next crazy idea that comes along will be! Is there a run or hike that is on your ‘to do’ list?